Take some time to look at the spacious campsites, park models, and private cabin rentals at our campground in Massachusetts offered by Lake Manchaug Camping. Our campground provides 3-way hook-ups for water, electric 20/30/50 amp, and sewer as well as telephone and cable services (provided for monthly/seasonal sites only). 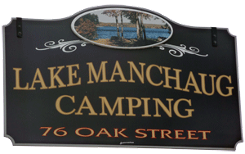 Lake Manchaug Camping is a gated RV park with water activities. Restrooms and showers are located within the campground and are maintained on a daily basis. You’ve worked hard lately and your vacation time is approaching. Now is the perfect time to take the family on that relaxing holiday. Private cabin rentals create the ideal opportunity to connect with family and friends, or have a romantic weekend away with that special someone. When you book a rental cabin with us, you can look forward to a quiet week, hidden away from the bustling city streets. We provide a tranquil atmosphere for all renters to enjoy. Escaping to the woods is a chance to get in touch with nature, view the stars at night, and breathe in fresh country air. Allow yourself the pleasure of watching a gorgeous sunset across a lake when you choose one of our lakeside cabin rentals. A lakeside cabin is the perfect place for your family and friends to swim, barbecue, and have a blazing campfire at night. When you rent a cabin with us, you get the opportunity to spend time in the great outdoors, or pop back inside to the comfort of a fully-equipped space. A private rental in an accommodating cabin gives our guests the opportunity to relax in comfortable, spacious rooms, relive old memories with family and friends in a shared space, share stories, or even host that game night that is sure to entertain. Make a privately cozy cabin your home away from home. Find your perfect camping getaway when you book one of our private camping sites. Our campsites cater to a variety of different camping styles, whether you are looking for a family-oriented space or something quiet and peaceful for a romantic getaway. We offer full hookups at each site, so you are free to bring your RV at your convenience or bring a tent if you wish to camp on the ground. We provide extensive amenities including water activities, to ensure comfort and fun to all types of campers. Please call for reservations to learn more about our lakefront vacation spots. Advance registrations are required, and email reservations are not accepted for our campsite and private cabin rentals. The weekly rates for off/on water are considered six nights, seven days. A three-night minimum is required on holiday weekends (Holiday Weekends - No Refunds). Cancellations within 14 days of the reservations will not receive credit or refunds. A $25 service/processing fee is required for cancellations and returned checks. Check-in at 3:00 p.m. or later, and check-out by 11:00 a.m. or you will be charged an additional fee. We welcome all varieties of campers to our grounds. However, you must be 21 years of age or older to register for a site at Lake Manchaug Camping, LLC. The above rates are both off-water. Contact us today to book one of our spacious campsites or cabins. We proudly serve all potential campers in the state of Massachusetts.